Can the Ultimate GPS be used for High Altitude? How can I know? Modules shipped in 2013+ (and many in the later half of 2012) have firmware that has been tested by simulation at the GPS factory at 40km. HOWEVER these modules are not specifically designed for high-altitude balloon use. People have used them successfully but since we (at Adafruit) have not personally tested them for hi-alt use, we do not in any way guarantee they are suitable for high altitude use. Is the Ultimate GPS affected by the 2019 Week Rollover issue? The ultimate GPS (all firmware versions from 20110922_GTOP_EVK01_A2.10 and higher - any sold after 2011) have been tested to work fine through 2019. OK I want the latest firmware! Here is the binary of the 5632 firmware, you can use this tool to upload it using an FTDI or USB-TTL cable (or direct wiring with FTDI). We do not have a tutorial for updating the firmware, if you update the firmware and somehow brick the GPS, we do not offer replacements! Keep this in mind before performing the update process! I've adapted the example code and my GPS NMEA sentences are all garbled and incomplete! We use SoftwareSerial to read from the GPS, which is 'bitbang' UART support. It isn't super great on the Arduino and does work but adding too many delay()s and not calling the GPS data parser enough will cause it to choke on data. If you are using Leonardo (or Micro/Flora/ATmega32u4) or Mega, consider using a HardwareSerial port instead of SoftwareSerial! My GPS is giving me data but the location is wrong! How come I can't get the GPS to output at 10Hz? The default baud rate to the GPS is 9600 - this can only do RMC messages at 10Hz. If you want more data output, you can increase the GPS baud rate (to 57600 for example) or go with something like 2 or 5Hz. There is a trade off with more data you want the GPS to output, the GPS baud rate, Arduino buffer/processing capability and update rate! Experimentation may be necessary to get the optimal results. We suggest RMC only for 10Hz since we've tested it. 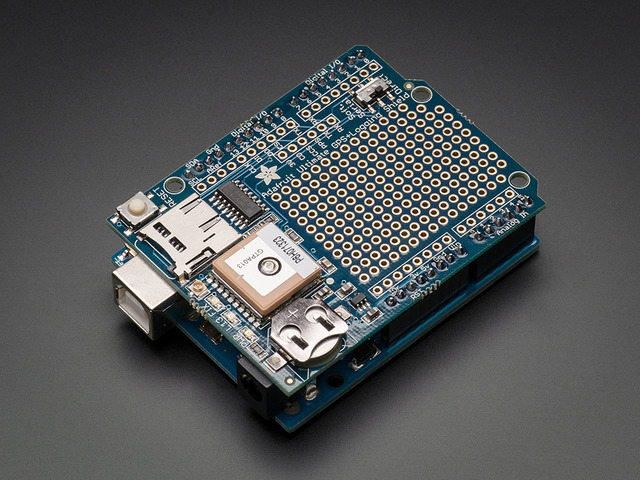 How come I can't set the RTC with the Adafruit RTC library? The real time clock in the GPS is NOT 'writable' or accessable otherwise from the Arduino. Its in the GPS only! Once the battery is installed, and the GPS gets its first data reception from satellites it will set the internal RTC. Then as long as the battery is installed, you can read the time from the GPS as normal. Even without a proper "gps fix" the time will be correct. The timezone cannot be changed, so you'll have to calculate local time based on UTC! This guide was first published on Feb 18, 2013. It was last updated on Feb 18, 2013. This page (F.A.Q.) was last updated on Apr 24, 2019.